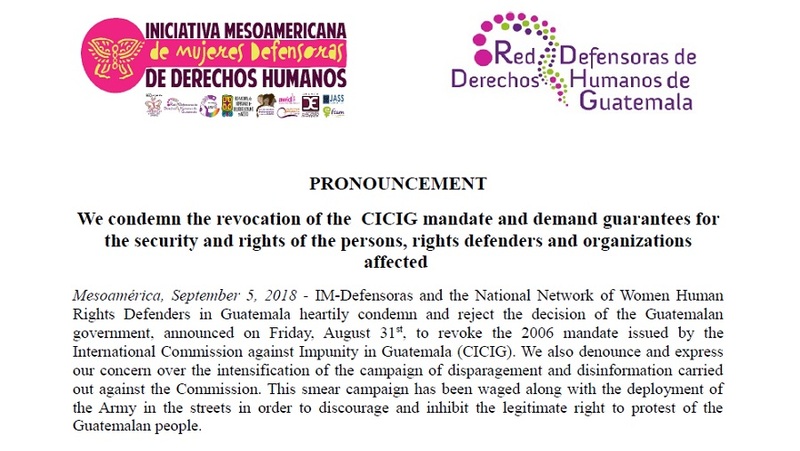 Mesoamérica, September 5, 2018 – IM-Defensoras and the National Network of Women Human Rights Defenders in Guatemala heartily condemn and reject the decision of the Guatemalan government, announced on Friday, August 31st, to revoke the 2006 mandate issued by the International Commission against Impunity in Guatemala (CICIG). We also denounce and express our concern over the intensification of the campaign of disparagement and disinformation carried out against the Commission. This smear campaign has been waged along with the deployment of the Army in the streets in order to discourage and inhibit the legitimate right to protest of the Guatemalan people. In line with the viewpoint expressed by the IACHR1 and numerous national and international human rights organizations,2 we recognize the vital role of the CICIG in the struggle against corruption in Guatemala through investigations that have pointed to the involvement of all three branches of government, and also recognize its essential role in strengthening justice and the state of law in the country. Undoubtedly, the dismantlement of the CICIG is an arbitrary decision based on the particular interests of government authorities and oriented towards consolidating impunity with regard to numerous cases of corruption that have been uncovered and are now subject to judicial proceedings. The vital work of the CICIG against corruption and impunity is a cornerstone in the defense and protection of women’s rights and the eradication of gender violence. Attacking the legitimacy, credibility and history of CICIG work also indicates an attack on the diverse struggles of women, the LGBTI population, indigenous peoples, and different social movements, for the full-fledged exercise of their rights. We are especially concerned that this measure will be implemented along with criminalization campaigns against persons and organizations engaged in the defense of human rights and against those who work with the CICIG, whose contribution has been crucial in the struggle against corruption and impunity. Revoke this decision and reinstate the CICIG and its essential work against impunity and in favor of justice and democracy in Guatemala. Ensure that the CICIG and its personnel have guarantees for their integrity, security, and ongoing stay in the country, as well as conditions that allow them to continue engaging in their vital work. Guarantee the security, integrity and rights of organizations and persons defending human rights, who have supported processes of justice and a stronger state of law, as well as Guatemalan people exercising their legitimate right to protest.